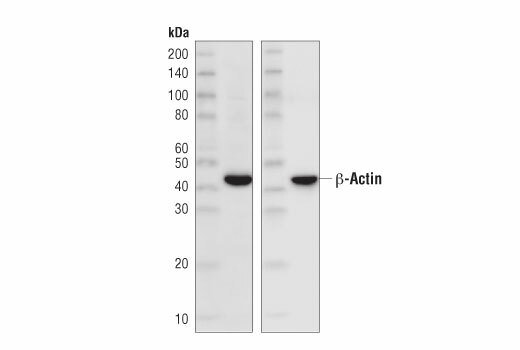 Western blot analysis of extracts from HeLa cells using β-Actin (8H10D10) Mouse mAb #3700 as the primary antibody. Rabbit Anti-mouse IgG (Light Chain Specific) (D3V2A) mAb (HRP Conjugate) (left) and Rabbit Anti-mouse IgG (HRP Conjugate) #7076 (right) secondary antibodies were used. Western blot analysis of decreasing concentrations of total mouse IgG reduced and denatured in 1x SDS loading buffer with DTT using Rabbit Anti-Mouse IgG (Light Chain Specific) (D3V2A) mAb (HRP Conjugate) (left) or Anti-Mouse IgG (HRP Conjugate) #7076 (right). This Cell Signaling Technology antibody is conjugated to the carbohydrate groups of horseradish peroxidase (HRP) via its amine groups. Rabbit Anti-mouse IgG (Light Chain Specific) (D3V2A) mAb (HRP Conjugate) recognizes native mouse IgG. It also recognizes the denatured and reduced mouse IgG light chains (about 25 kDa) on a western blot. Monoclonal antibody is produced by immunizing animals with native total mouse IgG. Rabbit Anti-Mouse IgG (Light Chain Specific) (D3V2A) mAb (HRP Conjugate) only reacts with native IgG and denatured and reduced mouse IgG light chain. 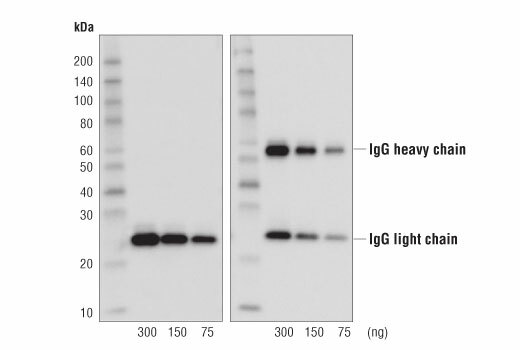 When performing immunopreciptiation (IP) followed by western blotting, the denatured mouse IgG heavy chains of the primary antibody used for IP run at approximately 50 kDa on the subsequent western blot and can often obscure bands of proteins that have similar molecular weights. Using Rabbit Anti-Mouse IgG (Light Chain Specific) (D3V2A) mAb (HRP Conjugate) as a secondary antibody will eliminate this problem.